Flanders is truly a legendary secondary character in the Simpsons. While modern episodes portray him as more of a religious nut who seem to have nothing else better to do other than scrutinize TV shows, the earliest of the classical era sees him as a normal religious man who maybe somewhat over-reliant on Christianity, but still full of character and life. In this episode, we get our first real look at Ned Flanders, and their relationship to the Simpsons. When Homer is invited over to Flanders' for a cold beer, he is enraged by Flanders' better station in life than him. Whether it is in "Simpsons Roasting On an Open Fire" or here, the Flanders have always been portrayed as a family that not only is more financially well off than the Simpsons, but also seem more coherent and united as a family. Whether it is Todd kissing his father on the cheek, or his expensive playroom basement, everything seems to be planned to rub Homer in the face. As a result of Homer's outrage, Ned throws him out of his house and Homer stomps home. At home, Homer is unable to find any faults with Ned Flanders, and is unable to express his dissatisfaction of the Flanders. 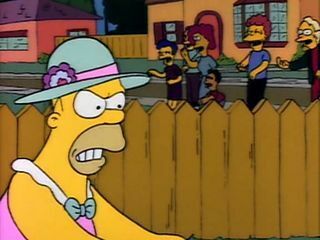 As a result, when Homer and Bart meets the Flanders at a little putt golf course, Homer quarrels Ned into signing up their child to a putting league and placing a high stake of the loser's parent mowing the lawn in their wife's dress in order to have a chance at humiliating Ned. As a result, Bart is pressured into wining the league. Here, we begin to see some of Homer's obnoxious parenting. Whether it is forcing Bart into giving his putter a girl's name ("Mom? "), or it is claiming that Bart is out of the family if he fails, Homer really is doing Bart more harm than good. However, you do have to feel for Homer for his dedication. From sitting at Bart's bedside all night before the tournament to asking for Marge's opinion on a less humiliating dress when he thinks all hope is lost, Homer is desperate to put down Flanders in order to satisfy his petty pride Luckily, Bart receives some proper putting coaching from Lisa and manages to make a tie with Todd on the day of the tournament. Homer is nothing if not relentless and simpleminded. Even though Todd and Bart had a tie, Homer is still determined to humiliate Ned Flanders even if he has to wear a woman's dress himself. To his dismay, while Ned utilizes this opportunity to entertain himself and the crowd to make the experience more enjoyable, Homer is mostly annoyed that his plan not only didn't work, but also backfired. Homer is a petty but determined man. When he sets his mind on anything, he will follow through in any way possible in order to accomplish the task. Whether it is humiliating Ned Flanders or, in a future episode, buying Lisa a pony, Homer is willing to sacrifice anything to accomplish whatever that he feels is right. At the same time, we see a bit more of Ned Flanders not only as a simple one dimensional character, but morphed into a real human being that generally has a better life than Homer, but also is a normal religious man. The Simpsons have always been small town people. Living in a small town like Springfield has its benefits and its disadvantages, and for better or for worse, the Simpsons are stuck here for all eternity. In "Dancin' Homer", we see what happens when small town folks like the Simpsons move into the big Capital City. When the Simpsons go to a company outing for a baseball game and after Bleeding Gum Murphy's hour long anthem, Homer's rambunctious dancing nets the Isotopes their first win in 29 games. As a result, the team owner gives Homer a job as a mascot. While later years Simpsons will put Homer in random crazy jobs, here the job at least suits Homer with his impulsive happy-go-lucky personality.With this new job, Homer finally finds something he loves and is successful at. 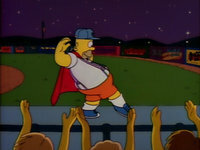 As more and more Springfieldians come to not watch the Isotopes but watch Homer, the owner offers a great opportunity to be a mascot in the capital city. Here we see Marge being strangely supportive of moving to Capital City. Marge has always been a more cautious, an almost foil to Homer type of character. Her decision to support Homer in, more or less, impulsively moving to Capital City is somewhat strange to me. Nevertheless, the Simpsons go to Capital City and see all the great sites that they have missed over the years. From 4th road and D street, to a bum wiping their windshield, the Simpsons indulge themselves in all that a big city can offer. However, when it comes time for Homer to shine on the ballpark, he is horrified to find that big city people don't find his dancing entertaining, and sees it as a means to make a fool of himself. With Homer's failure as a mascot for the big city, he is fired and moves back to Springfield. Even though Homer is disappointed that he humiliated himself in front of the big city crowd, he finds comfort among his family and his friends. This episode definitely has it shares of bloopers. For one thing, while Homer and the Simpsons don't belong in Capital City, Homer was successful at entertaining Springfield and could have easily continued his mascot career back at home. Secondly, it seems as though Homer sold all their house possessions already before they left, so what are they going to live in if they sold all their furniture and such? This episode certainly isn't the best the classic era has to offer. However, much like all other episodes, it grounds itself in reality. While its execution in both characterisation and plot maybe a little off, it generally has a theme that abides by the values the Simpsons portray. In the end, the episode still gave a more or less realistic portrayal of the Simpsons' trip to Capital City and its effects on them. The ending may seem a little forced and the characterisation may seem a little off and there are tiny plot holes, but the episode still is mostly portrays a workable Simpsons story. As mentioned before, The Simpsons is known for its brilliant outlook on many different aspects of life. Whether it is family, gay issues or in this case, politics, The Simpsons always bring their views onto the table while giving fair presentations of both sides of every issue. In this episode, we get to see our every first glimpse of the writers' take on elections and politics in general. When Bart and Lisa manages to fish a three eyed fish out of a pond that is being dumped radioactive waste from the nuclear plant, the nuclear plant is put up for inspection. Needless to say, the plant fails the inspection to such a degree that Burns attempts to bribe the inspector. After being forced to either shut down the unsafe plant or spend 55 million dollars fixing it, Burns, with words of inspiration from Homer, plans to run for governor. Here, much like the election team in real life, Burns' election team is split into two groups, where one is used to make an evil Burns appear like a saint, while the other to trash his opponent as much as possible. Burns is an infamous character in Springfield, and to make him popular among voters is truly no small feat. With his brilliant campaign that are "the best money can buy", Burns soars in voters' popularity. It is important to realise that while it seems that the corruption of the election may seem to have only come from the campaign team, the writers' also point their fingers at the voters. While Bailey seem to trust that the voters are not "gullible fools" that Burns believe they are, Burns' campaign videos consisting of false and repetitive empty promises with flashy cover ups ("Super Fish!"). However, such phoniness do manage to sway a lot of voters like Barney and Grampa Simpson, who represent the less intelligent and lower class citizens. To secure Burn's victory, the campaign team asks him to dine in one of his employees' house on the night before election to reestablish his connection with the common man in the form of Homer Simpson. Throughout the episode, Marge and Lisa represents the righteous and more intelligent citizens, who are alone in their defence of the uncorrupted Mary Bailey. When Burns visits their house and threatens to overtake Bailey to win governor position. Marge pulls out a cooked three eyed fish and indirectly makes Burns devour his promises. When Burns spits out the fish, his campaign also falls with him as he trudges away back to his nuclear plant, not before vowing to make Homer's dreams unfulfilled. "Two Cars In Every Garage and Three Eyes On Every Fish" not only brings up an important issue regarding to the nature of politics, but also represent them in a way that is much more mature than any other show could possibly imagine to present it. From bribing the safety inspectors to lavishing money on his campaign team, while The Simpsons points out the major problems of corruption regarding to candidates in the form Montgomery Burns, The Simpsons also recognises that the voters are either too greedy for their own good to choose a proper leader (such as Homer Simpson worrying about not getting fired), or just too stupid and buys into false promises( like Barney). It is a unique trait of the Simpsons possesses: the ability to present a view while not pointing out a clear villain, but claiming that all parties are responsible to at least some degree. Such mature and realistic takes on issues are one of the reasons why the Simpsons is one of the greatest shows ever. Ahh, the very first Treehouse of Horror. A tradition that prevailed through the all of classical era and into the modern days. While the modern Treehouse Of Horrors are mostly lacklustre and forgettable, the Halloween special during the classical ages are a true show of the writers talents. For only one occasion every year, they are allowed to throw away plot believability, and write whatever their imagination carries them. In the classical era, the Treehouse Of Horror is a true indication of the writers' creativeness, and is still relevant years to come. To me, Halloween specials don't necessarily have to be scary. Meaning, I don't really should have to have trouble going to bed after watching it. In a world where there are already children murdering their parents and people being burnt alive, it is getting increasingly difficult for people to be scared. However, although Treehouse Of Horrors don't necessarily have to be tamed, plot still must be coherent and characterisation must be at least reasonable: that means Homer is only allowed to want to kill Bart if he is possessed, but not by his own will. Only the first Treehouse of Horror actually involves a treehouse, where the kids tell three scary tales in the treehouse with Homer outside eavesdropping on the stories. The first one involves your typical haunted house. When the Simpsons move into a house that is ridiculously under price, they find that the house is haunted. However, due to the low price saving Homer thousands of dollars, the Simpsons sleep through the night with the house mind controlling them into wielding a knife and running around in circles attempting to kill one another. When Marge finally confronts the talking house, the house is given a choice of destroying itself or living with the Simpsons. Seeing how the Simpsons is unwilling to leave, the house destroys itself. The second story involves our first appearance with the aliens Kang and Clang. The aliens visit the Simpsons house and pick up the Simpsons onto their spaceship. At first, the aliens seem nice enough to give the Simpsons good food. However, a suspicious Lisa finds a cookbook titled "How to Cook Humans". The aliens interrupts and blows off some dust to reveal the title as "How To Cook For Humans". Lisa blows off some more and find it to be "How To Cook Forty Humans". And Clang changes it to "How To Cook For Forty Humans". In the end, the aliens are devastated that the humans suspected their welcoming gestures, and throw them back onto Earth, not before condemning their mistrustful nature. The last story portrays Homer as a character in a poem where he confronts Bart the raven. Homer finds people knocking on the door, but no one is there. When Bart the raven flies into his room, Homer finds himself constantly pestered by this raven. After multiple futile attempts at chasing the raven out, Homer finds himself trapped in the room with the raven with devilish eyes and malicious contempt. The Treehouse Of Horrors are truly interesting genre of the Simpsons. 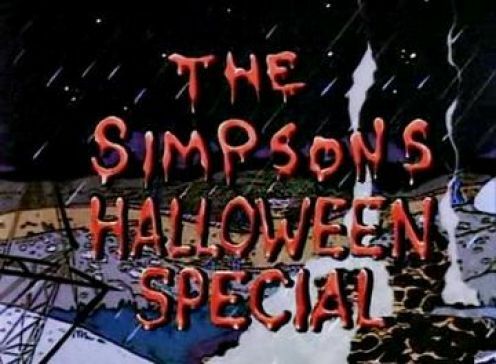 While they may not conform to your typical style of Simpsons episodes, each and every segment of the Halloween special has a very distinct Simpsons feel to it. Even though most of the stories are overused scary stories (haunted houses, alien abduction...), the writers always put a Simpson spin on all of them. While the Treehouse Of Horrors don't truly offer any tremendous insight into the Simpsons, its brilliant parodies of other works entertains those who do know the source material and still have something left over for those like me who doesn't. Because it is a Treehouse Of Horror episode, there won't be distinct categories on marking. Partly because I don't really know how to be perfectly objective in marking these episodes, and partly because plot believability is out of the window and non standard Simpsons episodes are generally not my forte. So there only will be an overall mark. The Simpsons is considered one of the best shows and ground breaking for many reasons. Among them include an honest portrayal of a family that realistically resembles most families here on Earth. Another is its general take on major topics not blatantly, but with subtlety. In "Simpsons And Delilah", we get a glimpse of how classic Simpsons handle some of such issues while remaining subtle and present a mostly objective look at such issues. When Homer is presented a cheap commercial regarding a "miracle cure" to male baldness, Homer, in typical light headed impulsive Homer fashion, rushes to purchase said product. Upon finding out the product costs $1000, he finds a way to exploit the company insurance to pay for it. After he uses it, for once and truly miraculously Homer gets his hair and is immediately spotted by Mr.Burns. In typical "judge a book by its cover" fashion, Mr. Burns randomly promotes Homer to junior executive and to a "better life". With his new position, Homer needs an assistant for himself. While looking for a good applicant, Homer finds a perfect worker for him in the form of Karl. Karl is truly a once-in-a-lifetime opportunity for Homer. From teaching Homer company cultures that he must learn to survive as a junior executive, to finding a perfect suit for him to hide his less than perfect body shape, to even planning a surprise for Marge, Karl is much less of an employee for Homer than a life partner. However, in typical classic Simpsons style, Karl's sexuality is done with subtlety. Rather than outlandishly giving Karl gay stereotypes, this episode handles controversial issues such as this expertly by portraying Karl as a normal nice guy, and just like all non gay characters. With Karl's help, Homer becomes extremely successful. From being able to increase worker's production rate to decreasing accident rates, Homer is becoming more and more favored by Burns. After a bathroom incident of Smithers being shut down by Homer to dry his boss' hands, Smithers takes revenge by finding out about Homer's exploitation of company insurance to buy the hair product. With Burn's stingyness and Burn's permission to fire Homer. Smithers sets up to get Homer. However, again Karl steps in and saves Homer in the form of taking the responsibility and getting himself fired. Homer doesn't get away cleanly though, Karl is gone from him. To make matters worse, Bart spills Homer's hair solution at home. Now without his hair, Karl does him one last favor by writing him a major speech for Homer to present where failure could mean being fired from the company. In a typical Simpsons style, Karl instills in Homer typical sitcom morals by telling him that hair is not the reason that Homer is successful. However, also in typical Simpsons fashion, the moral is flipped when Homer is undermined at the speech simply because of his hair. Back at the nuclear plant, Burns considers firing Homer, but instead demotes Homer back to his original job in a rare act of kindness. The Simpsons in its classic era is boundlessly creative. Back in the 1990's, shows in general, much less cartoons, tend to avoid discussing gay issues. The Simpsons, however, not only portrays a real gay character in the form of Karl, but also is able to do it with such expertise while presenting a mostly non biased and realistic look at gay people. Whereas other shows may have ended with Homer making a brilliant speech at the end and reinforcing the age old moral, the Simpsons not only is able to challenge the status quo by providing a more realistic and mature look at the situation, but also gives a fair view of the gay issues in general. After a summer of Bartmania in 1990, the second season opens with a much more down-to-earth look at Bart Simpson. While season one was responsible for the creation of a portrayal of Bart that seems anti societal and as an American bad boy in general, here we truly see him where he is most vulnerable. And like a typical kid, he has hopes and dreams and fear of failure. 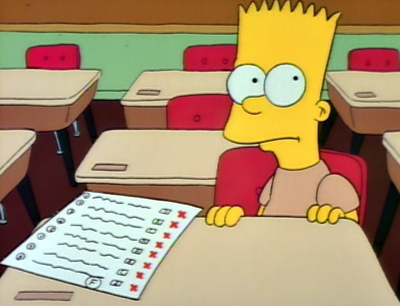 In "Bart The Genius", Bart was portrayed as a lackluster academic performer. That theme is continued here as Bart fails to give a proper book report on Treasure Island after Martin Prince's fantastic Old Man and The Fish report. When Bart flunks another test after utilizing many of his friends to give him false answers, he is subjected to the dreaded parent meeting where Mrs.Krappapple reveals that Bart must stay in the fourth grade if he should fail another test. Here we see a hint of the more natural and vulnerable side of Bart: Even though he seems to be a happy-go-lucky prankster most of the time, he is still as much a kid as any other children. When subject to a future of spending another year in fourth grade and being humiliated, he vows to pass the next test. Bart definitely tries. However, just as any other kid, he is easily distracted and cannot concentrate. When Bart spends another unproductive night drawing random scribbles on his textbook, he prays for a snowstorm to delay his test. He gets his wish in the form of a brilliant scene of every character in Springfield playing and celebrating in the once in lifetime summer snow. To prevent himself from getting distracted, he locks himself in the basement to study. To his dismay, his studying can only come in the form of imagining congressman writing their names in the snow. When the day of the test arrives, Bart is horrified to find that even through his most earnest efforts, he still fails the test. In a complete breakdown, he balls out at the teacher and accidentally utters historic references. In sympathy for Bart, Mrs. Krappapple raises his mark by 1, barely passing Bart who ecstatically kisses the teacher and leaps out of the room. While the ending may seem a little cheesy and stretching the realism a little bit, "Bart Gets An F" adds another dimension to Bart's characterization. While he maybe a non conformist bad boy, he still is a kid who wants to do well in life. Just as any other human being who is at stake of failing a test, Bart has his fears and when it comes down to it, he will try everything in his capability to do his best, but that can only take him so far. At the end, Bart is never that good at academics and when he performs at his absolute 100%, he merely only gets a bare pass. Whether its tests or just life in general, sometimes when we give absolutely everything we have, we can only take satisfaction in a 60 marks paper next to a wall of 100 marks papers from other people. The Simpsons began as a ground breaking show. After Season one's airing, Bart mania hit in the summer of 1990 as massive T-shirt and other crappy Simpsons merchandise sales exploded. At first, the Simpsons is mostly looked as a show to go for one-liners and funny jokes. After all, "D'oh" made the dictionary and "Aye Carumba" and "I'm Bart Simpson, who the hell are you?" are so popular that it literally is known by everyone nowadays. However, as we all know, the Simpsons is so much more than that. Many Simpsons fans writes off season one as a classic episodes. While a few of the reasons that have been brought up for this maybe valid, many of the reasons merely indicates the Simpsons characters look and behave differently from the later seasons. For me, I feel that the definition of Classical era is a close portrayal of a real and functional imperfect family. In Season One, while it can be said that Smithers is black (Herp Derp), Marge gets drunk, and Homer actually wants the family to behave and contemplates suicide, it is either so trivial or done in a way that is believable. For example, Marge getting drunk and Homer wanting the family to behave are off characterisations, but they don't affect that Marge is mostly unappreciated and loves her family for who they are, and it doesn't change the fact that Homer is a selfish buffoon but does everything he can for his family. Getting drunk and Smither is black are merely differences on the surface, but the heart in those characters never changed when transitioning from Season one to Season two and so on. Ultimately, I feel that Season one is really the most underrated season in all of the Simpsons. While it is true that there is an off episode called "Homer's Night Out", episodes like that also exist in other classical seasons. In general, I feel that although Season One does have some surface differences compared to other classic seasons, the characters still conform to what we will see in later classical seasons. The characterisations and the storytelling are still consistent, and I do feel that Season One is a solid groundbreaking season that created a solid foundation for later brilliant seasons to come. Note: All seasons will have the same rating format as episodes. Except that each scoring will be an average of all the episodes within the season. The only scoring that won't be an average is subjective section, which is my view on the season itself. The seasons will still be rated out of 10.